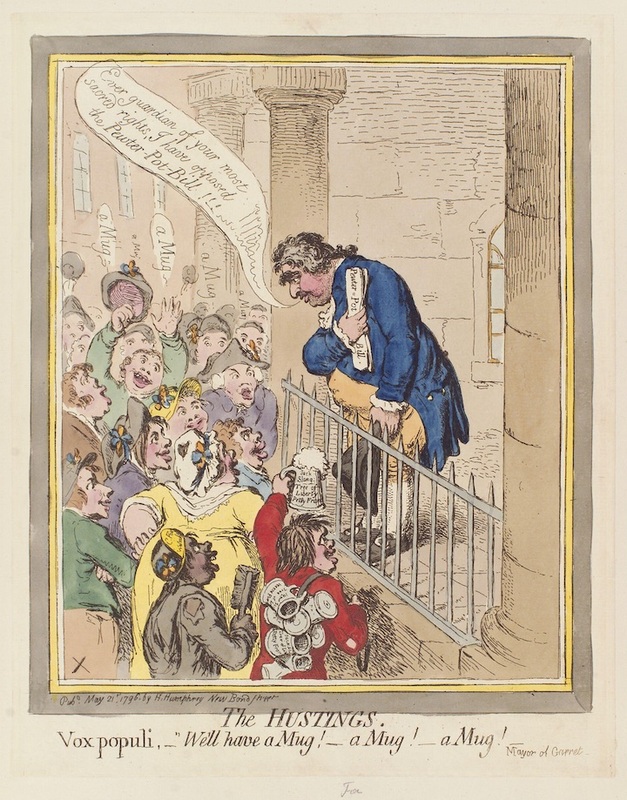 The hustings (Charles James Fox), by James Gillray published 1796. National Portrait Gallery, London, via Wikipedia Commons. To have a healthy democracy, it is not enough to hold regular elections, or for every person to get one – and only one – vote. At the heart of democracy is the idea that by voting for a particular party, the people confer upon that party legitimate authority to govern. But if a vote is to justify a ruler’s claim to authority, a number of conditions need to be met. What is a person doing when they tick a box on an election paper? Most directly, they are expressing a preference to be governed by that party. They will usually have reasons for choosing that party over another. Perhaps they believe interest rates will be lower under that party, or the economy will be better-off. Or, perhaps they think that party will make their country a fairer place to live. Overall, they may think that party is more likely to make Australia the type of place the voter thinks it ought to be. Now it may be a matter of debate whether or not the voter’s reasons are well-founded. Consider the belief that “interest rates will remain lower under Party A”. Although a voter might sincerely believe this to be true, they may or may not have good reasons for the belief. Unless the voter is an economist, they will rely on the expressed views of others for their opinion. And it seems reasonable to suppose the voter will be influenced by voices that have gained prominence in public discussion. We now come to a central point. Public discussion may be more balanced and comprehensive, or less balanced and comprehensive. Some points of view might be given a thorough airing, while others are barely heard at all. Now suppose, hypothetically, public discussion was strongly skewed in one direction. A voter – let’s call him Smith – decides to vote in a certain way as a result of being exposed to this one-sided discussion. More specifically, he decides to vote for Party A because the discussion to which he has been exposed tells him they will keep interest rates lower. Under these circumstances, would we say that Smith’s vote had helped confer legitimate or justified authority on the elected government? I think we are inclined to say that if it did so, then it did only to a reduced or qualified extent. And if many people would have voted the other way had they been exposed to a more comprehensive or balanced public discussion – in particular if the outcome of the election would have been different – then we might say the government’s claim to have justified authority would be at least reduced. It might even be claimed that, in the relevant sense, the government does not have justified authority. This seems to suggest that, in a democracy, if an elected government is to have a strong or full claim to justified authority, public discussion before the election must be “sufficiently” comprehensive and balanced. The more comprehensive and balanced, the stronger the elected government’s claim to justified authority. This raises the question: “What ensures that public discussion will be comprehensive and balanced?” A brief answer is: it is more likely to be comprehensive and balanced if all wishing to have a say in the public discussion have a more or less equal power to be heard. In a society strongly divided into “haves” and “have-nots”, that power is not distributed equally. The wealthy will, in a variety of ways, be better able to get their point of view heard: they can afford advertising, publicists or lobbyists, they can help to finance “think-tanks” and, in a small number of cases, they can own media outlets. A society that is split between rich and poor is a society split between those with the power to be heard in public discussion and those that lack such power. A society with a more equal distribution of wealth is one more likely to produce balanced and comprehensive public discussion and so more likely to confer fully justified authority on those elected on the basis of that discussion. Equality is good for the health of democracy. John Wright is an Australian academic. He does not work for, consult to, own shares in or receive funding from any company or organization that would benefit from this article, and has no relevant affiliations. This article was originally published on The Conversation. Read the original article. If you value journalism, please help sustain us by buying a $1 day pass, or subscription. Facts and Opinions is an online journal of select and first-rate reporting and analysis, in words and images: a boutique for slow journalism, without borders. Independent, non-partisan and employee-owned, F&O performs journalism for citizens, funded entirely by readers. We do not carry advertising or solicit donations from foundations or causes. Subscribe by email to our free FRONTLINES, a blog announcing new works, and the odd small tale. Look for evidence-based reporting in REPORTS; commentary, analysis and creative non-fiction in OPINION-FEATURES; and image galleries in PHOTO-ESSAYS. Some of our original works are behind a paywall, available with a $1 site day pass, or with a subscription from $2.95/month – $19.95/year.